Golf clubs have come a long way since the days when they were made of wood and went by names like “longnose,” “spoons” and “niblicks”. Today’s clubs feature state-of-the-art materials and innovative designs that can compensate for a variety of weaknesses in a player’s game. Choosing the right clubs won’t get you the “green jacket,” but it can certainly make you more competitive. The USGA sets a limit of 14 clubs for regulation play; however, recreational golfers set their own limit. It’s important to consider what you think you’ll actually use—and how much you feel like carrying for 18 holes. A general set of clubs might include: a putter; a driver; three woods; and irons (all seven or a combination of numbers 4,5,6,7, 8, 9; a pitching wedge and possibly a sand wedge). 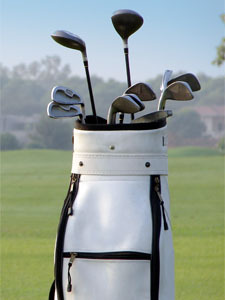 If you are new to golf, you might want to consider buying a boxed set of clubs. They often come with a bag and other accessories. It is an affordable option that does not overwhelm, and you can gradually replace clubs as you gain more experience. However, if you already have a feel for your strengths and weaknesses, it may make sense to buy specific clubs that will take those traits into account. In fact, the larger heads proved to be so beneficial in improving a player’s shot, the USGA moved to limit the size of the head to help preserve the competition of the game. The engineering of golf clubs has typically followed the evolution of golf ball technology. When the ball became harder, wooden shafts snapped with great regularity. Stainless steel solved that problem, but was heavy. These days, there are a variety of solutions including graphite shafts. These days, graphite and titanium shafts tend to be the most popular. Each offers a degree of “flex.” Flex affects the accuracy, distance and path of the ball. Graphite is more lightweight than titanium and has increased flexibility. These qualities benefit players with slower swing speeds, such as women and seniors. Also, if your drives tend to go to the right, you may find improvement with a softer flex. Titanium clubs provide a stiffer flex and tend to be more durable. They work well for players with a lot of power and fast swing speeds. Players with drives that veer left; may benefit from a stiff-flexed golf club. Why is it that even the pros are constantly experimenting with putters? Perhaps it is because about half the shots a player makes on any given day are made with this one type of club. Traditional bladed putters are challenging to control, but fortunately, there are plenty of other options available. We’ll take a look at just a few of the more popular styles. Designed by Karsten Solheim, the revolutionary Anser style putter is still a favorite among golfers. Its heal-toe weighted ends create a large sweet spot, and it is one of the most forgiving of the putter styles. Weekend golfers might also want to try the futuristic putters that feature a high-MOI (Moment of Inertia). They resist twisting even when the ball is hit off center. Many modern putters feature an offset shaft. The putter face is behind the shaft. It gives the golfer a clear line of sight to the ball making it easier to line up with the hole. Many golfers find it a have more natural feel. Face-balanced putters are equally weighted from head to toe. The idea behind this style is to restrict how much the clubface opens and closes during the swing. It is meant to be used with a straight-back, straight-through line. Both professionals and recreational golfers alike are enjoying the benefits of hybrid golf clubs. Hybrid clubs combine the club head of a “wood” with the length of a long iron allowing players to capitalize on the positive aspects of both. The design of the club head puts the center of gravity lower and back from the club face, which increases loft on the ball. Hybrids are more forgiving on the tough shots and their lighter weight makes them easier to swing. The growing popularity of hybrids may soon make them a staple in every golf bag.